Cats and mice are most times not friends. 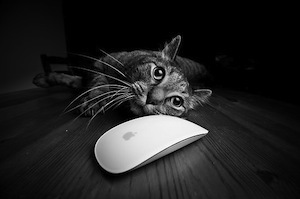 BUT this Magic mouse from Apple has a furry cat friend and they really like to hang around together. And this scene make the perfect photo for on your wall if you are a geek like me. And that is why you can get this Cat & Mouse scene as greeting cards, postcards and prints for fun and decoration. Time to have a better bigger look at these Cat & Mouse Prints.